Our company was founded on a dedication to customer service, and things haven’t changed there as we have grown. We value our loyal customer base and are continually looking for ways to better serve them. 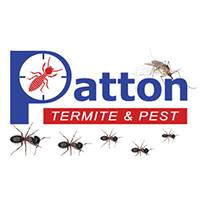 If you’re interested in working with a pest control company that truly takes pride in what they do, Patton Termite & Pest is the service for you. We look forward to changing the way you think about traditional Wichita pest control! Showed up on time. Seemed to know how to get rid of ants. Hopefully when they come back in 2 weeks for follow up, ants will be history! I would recommend Patton. This company is filled with assholes, and I don't even mean just literally. Its not even that but they are not genuine in any kind of way. Very professional behavior, attitude, and on time. James is the man. He was on time, courteous, and very professional. Disappointing. You called my home phone to confirm your visit and I was out of town so did not get the message until after your visit. I have told you I need to book on Tuesdays between 1 and 4 because that is when my cleaning ladies are there to let you in. You came at 4:23 on a Monday, could not get in (duh), so you sprayed outside only. Your Pest Summary says additional pest findings may have been observed. Please see conditions and comments for more details. There is no section called conditions and comments. Waste of time and money. I never saw the technician so I can't rate him. Can't complete the survey without that rating so I gave him a 3. This was however not his fault. Very nice, explained what he was doing and why. Solved the problem. Friday morning we noticed a huge volley ball size wasp nest in the 2nd story peak and eve of the house, it was hidden away out of site. I called for assistance as we are all allergic to their stings and the same day the nest was safely sprayed. This was excellent and speedy service uncommon in today's industry. The wasps have been almost all killed and the stragglers will die as soon as they return to this nest to work. Always a pleasant experience - the technicians are friendly, reliable and knowledgeable. Excellent, on time & efficient, paid by credit card (very helpful) will use again. Will refer to others. He was on time. He answered all our questions. He did not mind us watching everything he did. I felt he did a through. Been with Mike for many years. which is 350sq. ft. less than ours.Realize rates go up some but seemed high to us. I was pleased with the personality and efficiency of the technition Ryan. Thank you. The technician arrived on time and the service was professionally done. Very professional, was knowledgeable of previous concerns. Kyle is thorough, polite, and we trust him to take care of our home. As always, it was a great experience. Very professional. Highly recommend their services. The person arrived on time, and the appointment was efficient as usual. They SOLVED what was nearly impossible to solve... Will call them again if we ever have any other insects ... G.P. Best company I've experienced in the industry. Very reasonable prices and excellent service. On time, friendly and answered all my questions. Happy to have a good technician. Always on time. Kyle gets job done but still takes a little time just to talk. Makes visit seem more "personal". Service takes care of bugs - also came out when we had an "ant" issue. Patton really wants to help us stay pest clean. Excellent service and counsel. Professional and prompt technician. Excellent service! All the abts in my kitchen are gone! Excellent. Careful attention to my needs. ////////. The appointment was set up with the office staff and good. The service worker showed up on time, in fact a few minutes early and began his treatment. he covered the inside of the house, garage and treated the outside. He also inquired if I was having particular problems? The service man was very clean cut and professional in appearance. He was very knowledgeable and was able to answer all of my questions. And they were on time and quick. They were friendly, professional and on time. Most importantly I haven't seen the ants invading my home like before! Steve made the extra effort to help me with my concerns!
. A good experience. They also treated inside house for fleas. We just bought our house and it was inspected for termites, but they apparently missed the carpenter ants that were swarming all over the northwest side of the house. Tim noticed the signs right away, and once he started pointing them out to us, we couldn't unsee it. The previous company won't be taking care of our house anymore. We're with patton. Willing 2 schedule a time convenient 4 me. James called to advise of arrival time. James was courteous, efficient, & answered my questions. On-time, friendly and knowledgeable! Can't recommend enough! Ryan is the best. He really took time to analyze the ant problem and drive towards solution. I value ryan providing service to our house. The guys at Patton are always great. We utilize them for our company and home accounts, so we obviously think they do a wonderful job. They have a knowledgeable staff who know how to solve any problems you might be facing. I'm pleased with every aspect of my service - timeliness, thoroughness and professionalism of my technician. I asked him to spray my smaller backyard for fleas ticks ants and spiders which is approximately 27x27 and my dog pen for the same and it's 10x25. He sprayed around the outside of the house but not in the yard. He went inside the dog pen and stayed around the dog houses but not the whole pen. I asked him to spray inside my garage also and he did but it was a spotty spray. I'm still seeing spiders! Not very satisfied with this spraying. Very nice and polite. We will recommend to friends!